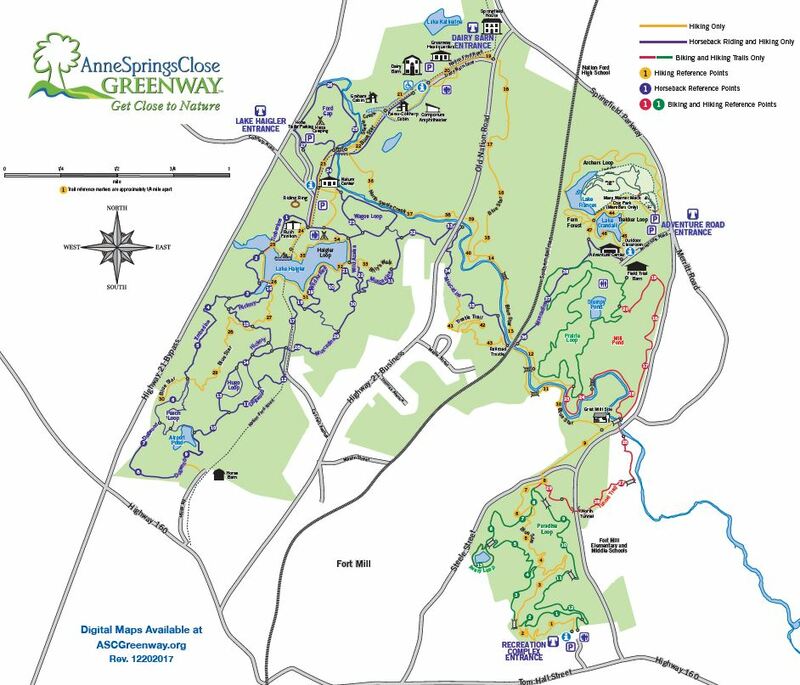 The Anne Springs Close Greenway is open seven days a week from 7:00 am to sunset. Please note that trails may be closed due to Greenway events and inclement weather; check our website daily for trail alerts and closures, or call the trail hotline at 803.547.1019. The Anne Springs Close Greenway has primitive tent campsites located on Lake Haigler that are available for reservation. Adjacent to the camping area, a bathhouse provides toilets and showers for campers. Horse camping with paddocks and frost-free hydrants is available at sites along the Nature Center exit road. Negative Coggins test required for all horses. For more information or to make a reservation, please call 803.548.7252. Take I-77 to exit 85 / Hwy 160 exit heading East toward Fort Mill. Go 1 mile from I-77 to traffic light at Highway 21 BYPASS. Turn left at light and proceed 1.5 miles. Entrance to the Anne Springs Close Greenway will be on the right. The Nature Center is to the left at the end of the access road; the Rush Pavilion is to the right.